Sister of St. Mary of Oregon Mary Alberta Schwall, 94, died April 1. There will be a vigil service at 7 p.m. Sunday, April 7, at the Motherhouse Chapel, and a funeral Mass at 4 p.m. Monday, April 8, also at the chapel. Sister Mary Alberta was born Jan. 25, 1925, in Nicolaus, California, to Albert and Josephine (Hermens) Schwall. Her elementary education took place in California where she attended public schools. After graduation from high school, she worked for the state’s department of employment in Sacramento for three years. She started as a beginning typist and advanced to senior secretary before moving to Oregon to join the Sisters of St. Mary of Oregon. Sister Mary Alberta was received as a novice Aug. 15, 1946, and made her perpetual profession in 1951. Her higher education was earned at Marylhurst (a bachelor’s degree in education, 1955), at the University of Illinois (a master’s degree in education, 1966), and at the University of Oregon (a master’s in supervision and administration, 1970). Sister Mary Alberta’s knowledge and skills were varied. She taught business courses, sewing, English, religion, physical education, and yearbook at St. Mary of the Valley; she also taught at Tillamook Catholic, and St. Boniface in Sublimity. 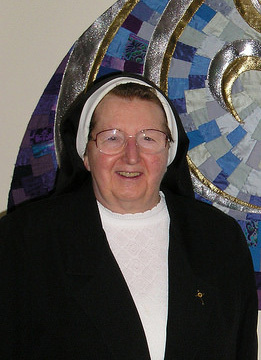 She served as teacher and principal at St. Matthew Elementary School, and Notre Dame School in Marysville, California; she was elected to serve as a council member, general secretary, and appointed education coordinator for the sisters; served as formation director of the new sisters; and ministered as a pastoral visitor at Maryville. Sister Mary Alberta was the principal of St. Mary of the Valley High School (now Valley Catholic High School) from 1966 to 1971. During this time, the construction of the current high school building took place. She was proud of that and the community was grateful for her highly organized plan for moving all things needed to the new building over the Thanksgiving break in 1969. The first day of classes in the new building was Dec. 1, 1969. Once a teacher, always a teacher describes Sister Mary Alberta’s recent activity of teaching anyone who was interested in learning how to knit. She was a life-long learner — getting new knitting patterns — on YouTube! Sister is survived by her brother Harold, her Sisters in Community including her sister, Sister Evelyn, and many relatives. She was preceded in death by her parents and her siblings, Ralph, Lawrence, Robert, and Anna. One of my favorite teachers of all time! She will be missed. Heartfelt condolences to the Schwall and SSMO families — Sharon LaVoie '67 Shafa This comment has been hidden due to low approval.